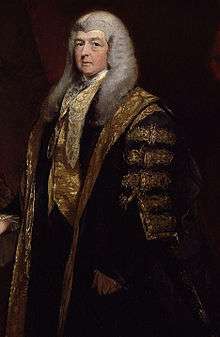 Lord Cottenham wearing ceremonial robes when presiding in the House of Lords as Lord Chancellor. Detail of a painting by Charles Robert Leslie. 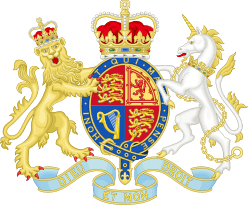 Charles Christopher Pepys /ˈpɛpᵻs/, 1st Earl of Cottenham PC QC (29 April 1781 – 29 April 1851) was a British lawyer, judge and politician. He was twice Lord Chancellor of Great Britain. Cottenham was born in London, the second son of Sir William Pepys, 1st Baronet, a master in chancery, who was descended from John Pepys, of Cottenham, Cambridgeshire, a great-uncle of Samuel Pepys the diarist. Educated at Harrow School and Trinity College, Cambridge, Pepys was called to the bar, Lincoln's Inn in 1804. Practising at the Chancery bar, Cottenham's progress was slow, and it was not till twenty-two years after his call that he was made a King's Counsel. He sat in Parliament successively for Higham Ferrers and Malton, was appointed Solicitor General in 1834, and in the same year became Master of the Rolls. On the formation of Lord Melbourne's second administration in April 1835, the great seal was for a time in commission, but eventually Cottenham, who had been one of the commissioners, was appointed Lord Chancellor (January 1836) and was at the same time elevated to the peerage as Baron Cottenham, of Cottenham in the County of Cambridge. He held office until the defeat of the ministry in August 1841. In February 1841, at the time of the trial of Lord Cardigan for attempted murder, Cottenham claimed ill health, leaving the task of presiding as Lord High Steward to the Lord Chief Justice of the Queen's Bench, Lord Denman. In 1846 he again became Lord Chancellor in Lord John Russell's administration. His health, however, had been gradually failing and he resigned in 1850. Shortly before his retirement, he was created Viscount Crowhurst, of Crowhurst in the County of Surrey, and Earl of Cottenham, of Cottenham in the County of Cambridge. He lived at Prospect Place, Wimbledon from 1831 to 1851. He had succeeded his elder brother as third Baronet in 1845. In 1849 he also succeeded a cousin as fourth Baronet of Juniper Hill. Lord Cottenham married Caroline Elizabeth, daughter of William Wingfield-Baker, in 1821. They had five sons and three daughters. He died at Pietra Santa, Lucca, in the Italian Grand Duchy of Tuscany, in April 1851, aged 70, and was succeeded by his eldest son, Charles. Lady Cottenham died in April 1868, aged 66. Cottenham's niece Emily Pepys (1833–1887), daughter of Henry Pepys, Bishop of Worcester, was a child diarist. ↑ This branch of the family pronounced the name "Peppis", not "Peeps", like the diarist. Gillian Avery: Introduction. In: The Journal of Emily Pepys (London: Prospect Books, 1984. ISBN 0-907325-24-6), p. 11. ↑ "Pepys, Charles Christopher (PPS797CC)". A Cambridge Alumni Database. University of Cambridge. ↑ Woodham-Smith, Cecil (1995) . The Reason Why. Smithmark. p. 77. Stephen, Leslie, ed. (1886). "Cottenham, Charles Pepys". Dictionary of National Biography. 7. London: Smith, Elder & Co.